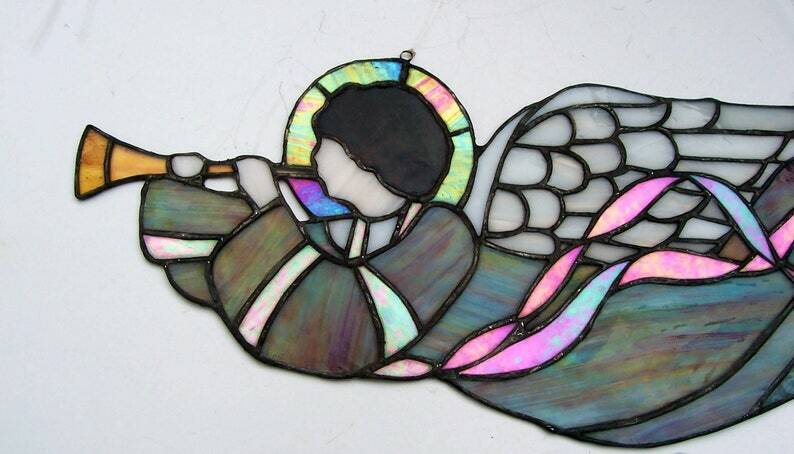 Stained Glass Flying Angel Panel measures 24 X 8.5 inches. Each piece was cut by hand and crafted in the Tiffany copper foil method. The halo and ribbon are iridescent glass, that shines like oil on water in reflected light. 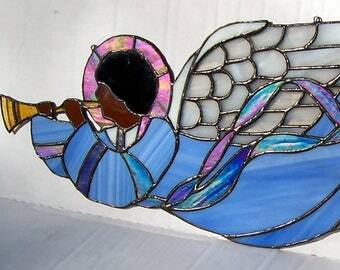 The angel is lovely hung across a window or between two rooms as a holiday decoration or a permanent fixture. Sometimes in life we need to share our feelings that are hard to bear. When in our hearts we feel such pain, that extra strength we have to gain, from someone who will keep us safe, and listen when we lose our faith. This guardian angel is here for you to light the way and help you through.